Imphepho (Helichrysum odoratissimum) is a strongly aromatic, multi-branched perennial herb with small silvery leaves and yellow flowers. Imphepho has had many historical uses, all of them of great interest. Indigenous peoples believe that ancestors make contact with them through their dreams. They employ imphepho’s aromatic incense in dream ceremonies that are crucial to their culture. 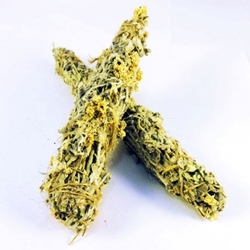 Most often, Imphepho is simply burned as ritual incense to invoke the goodwill of ancestors. So we thought it would be nice to have some Imphepho smudging wands. These hand tied wonders come to us directly from a small family farm in South Africa. Each weighs in at about a half ounce, and we sell two in a pack by quantity not weight. Just light the tip and blow it out when it smolders. Imphepho may also be combined with other ritualistic herbs. A strong-smelling, multi-branched perennial with small silvery leaves and small yellow flowers, Imphepho has many uses throughout history. As Africans believe that ancestors make contact with them through their dreams, they burn Imphepho in the hope that it will help them to reach the lucid dreams that are so crucial to their culture. Most often, however, it is burned simply as ritual incense to invoke the goodwill of the ancestors. On a related note, one of the more interesting historical uses of this plant is by healers in KwaZulu-Natal, who smoke imphepho either on its own, or mixed with a few dashes of shamanic tobacco. The smoke may also be inhaled as an incense rather than directly smoked, hence our Imphepho smudging wands. These hand tied wonders come to us directly from a small family farm in South Africa. Each weighs in at about a half ounce, and we sell two in a pack by quantity not weight. Just light the tip and blow it out when it smolders. Imphepho may also be combined with other ritualistic herbs. This product is not intended or sold for ingestion by humans or animals. It is sold only for use as an incense or for smoking. WARNING: Smoking anything, including herbal products of any kind, is harmful to the body. Do not leave burning incense unattended.